Author(s): Gopichand Chinta, Safiulla B. Syed, Mohane S. Coumar, Latha Periyasamy. Department of Biochemistry & Molecular Biology, Pondicherry University, P.O. Box: 605014, Pondicherry, India. Natural products, especially foods and extracts from plant origin have been successful in treating various disorders in traditional medicine. Piperine, a versatile bioactive compound is found in almost 2000 varieties of piper species from piper genus. The plants containing piperine, particularly, Piper nigrum (black pepper) and Piper longum (long pepper), are widely used in the traditional as well as alternative therapies for both human and domestic illnesses. Effect of piperine on gastrointestinal system, drug metabolizing enzymes, P-glycoprotein and alteration of bioavailability of other drugs are the major area of research. Particularly, bio-enhancing properties of piperine is of clinical importance, as co-administration with drugs for the treatment of human immunodeficiency virus (HIV) infections, pancreatitis, tuberculosis, hyperlipidemia, bronchial asthma and epileptic disorders, resulted in enhanced bioavailability of these drugs. Also investigations are being carried out to elucidate the underlying mechanism of action for the anti-fertility and anti-cancer effects of piperine. Comprehensive data regarding the in silico, safety, pre-clinical pharmacology, clinical studies of piperine and its derivatives are compiled in this review, to act as a guide for future drug development. Keywords: Bioavailability, bio enhancer, black pepper, long pepper, piperine, piperine derivatives. Affiliation:Department of Biochemistry & Molecular Biology, Pondicherry University, P.O. Box: 605014, Pondicherry, India. Keywords:Bioavailability, bio enhancer, black pepper, long pepper, piperine, piperine derivatives. Abstract:Natural products, especially foods and extracts from plant origin have been successful in treating various disorders in traditional medicine. Piperine, a versatile bioactive compound is found in almost 2000 varieties of piper species from piper genus. The plants containing piperine, particularly, Piper nigrum (black pepper) and Piper longum (long pepper), are widely used in the traditional as well as alternative therapies for both human and domestic illnesses. Effect of piperine on gastrointestinal system, drug metabolizing enzymes, P-glycoprotein and alteration of bioavailability of other drugs are the major area of research. Particularly, bio-enhancing properties of piperine is of clinical importance, as co-administration with drugs for the treatment of human immunodeficiency virus (HIV) infections, pancreatitis, tuberculosis, hyperlipidemia, bronchial asthma and epileptic disorders, resulted in enhanced bioavailability of these drugs. Also investigations are being carried out to elucidate the underlying mechanism of action for the anti-fertility and anti-cancer effects of piperine. 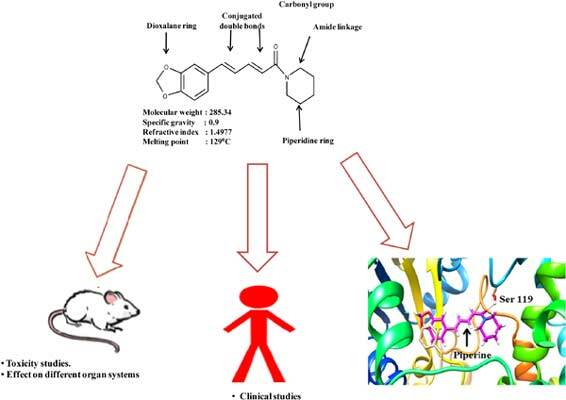 Comprehensive data regarding the in silico, safety, pre-clinical pharmacology, clinical studies of piperine and its derivatives are compiled in this review, to act as a guide for future drug development.